What tow car is best? Petrol or diesel? We've been towing with two VW Tiguans to give you the definitive answer! For most caravanners, choosing between petrol and diesel when deciding what tow car to buy used to be quite straightforward. For its fuel economy and pulling power, diesel was the obvious choice. Things aren’t so simple now. The VW ‘dieselgate’ scandal shone a light on diesel emissions, and diesel has been blamed for poor air quality in many urban areas. Plans to charge diesel drivers more to drive into some towns and cities have also hit the headlines. Sales have dropped as a result. To the end of October 2017, diesel cars accounted for 42.5% of all cars sold, down from 47.7% over the same period the previous year. So is now the time to switch from diesel to petrol power for your tow car, or perhaps consider a hybrid? To find out, we’ve looked at the facts behind the headlines. We’ve also tested two VW Tiguans – one petrol, one diesel – to see how the engine types compare from behind the wheel. It depends what is meant by ‘dirty’ and whether we’re talking about an older diesel vehicle or a brand-new car. For years, drivers have been encouraged to choose diesel cars because as a rule they emit less carbon dioxide (CO2) than petrols. Reducing carbon emissions helps combat climate change, so the more of us who drive a diesel rather than a petrol, the lower the total CO2 produced by private vehicles. However, since ‘dieselgate’, there’s been a renewed focus on local air quality. Diesels produce more nitrogen oxides (NOx) than petrols, and these are harmful to human health, especially to someone with an existing lung condition. What’s often not reported in ‘dirty diesel’ stories is that the difference in the permitted level of NOx emissions is now quite small. Under the current Euro 6 standard, the permitted level for diesel cars is 0.08g/km, compared with 0.06g/km for petrols. The limit for petrol cars didn’t change when Euro 6 replaced Euro 5 for new-to-market cars in September 2014 (and all new cars a year later), but the diesel limit was cut by more than half from 0.18g/km. Older diesels also produced more particulate matter (small particles that can damage the heart and lungs) than petrols. However, modern diesels have particulate traps to clean the exhaust and today, the permitted levels of particulate emissions for new diesel and petrol cars are identical. Of course, it would be naïve to think all new cars emit as little out on the road as they do in laboratory tests. Research by Emissions Analytics, published in 2016, found that just 11% of the Euro 6 diesels it tested met the lab requirements in real-world conditions. However, there’s now a new test protocol for fuel economy and emissions testing, the Worldwide Harmonised Light Vehicle Test Procedure (WLTP). This is backed by the Real Driving Emissions (RDE) step 2 test to sense-check the results on the road and force manufacturers to reduce the gap between the official results and genuine pollution levels. Will I be taxed more if I drive a diesel car? Again, this depends on the age of the car and which tests it has been through. In the autumn Budget, Chancellor Phillip Hammond announced that new cars which don’t meet the latest RDE 2 test standard would be bumped up a first-year Vehicle Excise Duty band from April 2018, even if they meet the Euro 6 standard in lab conditions. For company car drivers, the benefit-in-kind surcharge that already exists for driving a diesel car will go up from 3% to 4% for all cars which don’t yet meet RDE 2. There’s more to come, especially if you drive an older diesel. Head into central London from 8 April 2019 and you’ll have to pay an extra £12.50 if your car doesn’t meet the Ultra Low Emission Zone (ULEZ) standards – that’s in addition to the existing congestion charge and T-charge. For a diesel car, that means it must meet the Euro 6 regulation. However, it’s not just diesel drivers who will pay. Owners of older petrol cars that don’t meet the Euro 4 standard or better will also have to stump up or risk a fine. Other towns and cities have similar schemes planned to discourage owners of older vehicles to drive into urban areas. Oxford City Council could soon go further, with an outright ban on diesel vehicles from 2020. But you wouldn’t dodge the ban in a petrol car – all internal combustion engines would be unwelcome in the city centre if the plans come into force. Will I lose out if I switch over to a petrol vehicle? There’s a danger that in rushing to swap over to a petrol car, drivers are underestimating the financial benefits of running a diesel. Vehicle data company cap hpi estimates that diesel owners could be £380 a year worse off if they switch to driving a petrol car. Matt Freeman, managing consultant at cap hpi, says: “With many consumers concerned about the rising cost of living, diesel was a clear choice for anyone looking to reduce the cost of motoring. But what if reduced demand for diesel hits used car values? Couldn’t that wipe out the fuel saving? That’s backed by research from online car classified website Auto Trader, which continues to see more searches for diesel cars than petrols. What tow car is better? Is diesel still the best? The difference is not as stark as it used to be, because many modern petrol cars (especially turbocharged ones) have more mid-range pulling power than older petrol engines and they’re more fuel-efficient than they used to be. However, as a rule of thumb, a good turbodiesel still tows better than a good petrol engine. Not convinced? 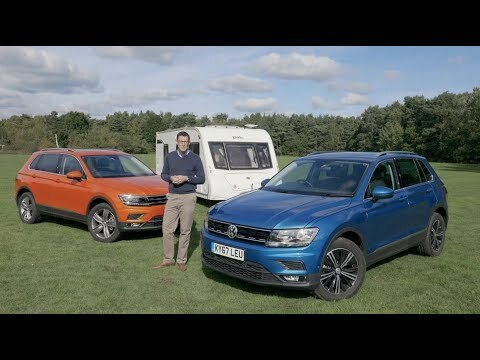 Watch our video (above) and take a look at our comparison between a petrol and a diesel Volkswagen Tiguan (below) to see why diesel engines are still our first choice for regular towing. So should I still buy a diesel-engine tow car? If you only tow occasionally and most of your journeys are short, a petrol car (or even a hybrid) could be a better choice than a diesel. However, for most caravanners, we would still recommend a diesel, especially if you are looking for a new or nearly new car that meets the Euro 6 emissions regulations. These cars are considerably greener than their reputation suggests, and will be far more fuel-efficient than a petrol, with or without a caravan in tow. The day is coming when diesel (and petrol) will be superseded, but it hasn’t arrived just yet. On the face of it, tow car drivers have more reasons than most to stick with diesel. The two most obvious are torque (twisting force or pulling power) and economy. Diesels typically have more torque and are more fuel-efficient – but modern petrols have been closing the gap on both counts. Are the best petrol cars now just as good? To find out, we’ve been towing with two VW Tiguans, one petrol, one diesel. In the petrol corner is the Tiguan 2.0 TSI 180PS 4Motion DSG. Diesels are represented by the 2.0 TDI 150PS 4Motion manual. Both cars towed the same 2010 Elddis Odyssey 540 with a MiRO of 1377kg. We put the two Tiguans through the same tests we use in our regular reviews, beginning with accelerating from 30-60mph, as you might when joining the motorway. The petrol had the advantage of more power, with 178bhp comfortably outgunning the diesel’s 148bhp. However, the diesel had 251lb ft of torque, beating the petrol’s 236lb ft.
Petrol’s power told, reaching the motorway limit in 11.1 seconds, a healthy 2.1 seconds faster than the diesel. In regular towing, the diesel needed fewer gearchanges and held its speed without needing to be revved as hard. fference was very slight – both towed easily to the top of the gradient. Perhaps the diesel needed fewer revs, but there really wasn’t much in it. Both also performed much the same in the lane-change test. With either engine, the Tiguan was grippy, agile and composed. fference in their handling and stability, both in this manoeuvre and when towing on the public road. One final test showed why we still think diesel is right for most caravanners. Towing the Elddis over the same roads in similar traffic conditions, the diesel achieved an impressive 30.3mpg. The petrol could only manage 20.8mpg. That’s enough to cost an extra £385 over 5000 miles of towing. In everyday driving, you’ll be quids in, too, as we’ve found the TSI petrol achieves low-30s mpg even when it isn’t towing. In like-for-like specification, the diesel costs £520 more to buy. But if our economy test is any indication, that will be recovered in lower fuel bills within a few months. For many years, higher resale values have helped to offset the higher price of a diesel. There are signs that used car values are beginning to weaken, but there’s no apparent collapse. According to our colleagues on What Car?, the diesel should hold on to 46% of its original price after three years and 36,000 miles, beating the petrol by 1%. The two cars are closely matched in just about every way. Acceleration, stability and hill-start tests didn’t reveal a definitive winner. fference in fuel economy allows the diesel to land a knockout blow.